Increase productivity, save time and simplify maintenance with tool-free squeegee and brush replacement. Intuitive, easy-to-understand controls are designed to simplify training and reduce re-work. Low, 68 dBA sound level enables energy-saving daytime cleaning. Optional lithium-ion battery provides up to 60 minutes of run time. Debris tray prevents clogs in the drainage system, reducing downtime and service calls. Reduce the risk of slip and fall accidents in narrow, congested spaces with excellent water recovery – in forward and reverse. The T1B eliminates cord hazards and constraints and enables cleaning even when people are present. Insta-Adjust™ handle maximises operator comfort. Optimal water recovery – even on 180-degree turns – helps minimise the risk of slip and fall injuries in your facility. Ensure clean, streak-free floors with optimal water recovery that eliminates streaks and maximises soil removal. Optimal water recovery eliminates streaks and maximises soil removal to ensure clean floors so facilities always look their best. Excellent down pressure and pad RPM provide powerful cleaning. 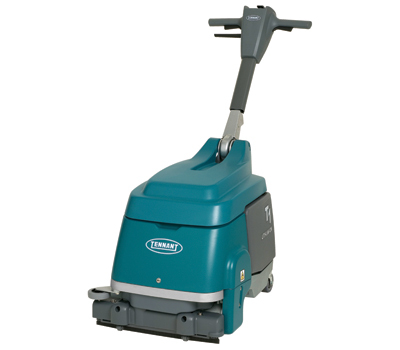 Effectively cleans confined spaces in forward and reverse to keep facilities looking great. 380 mm cleaning path is perfect for cleaning entryways, vestibules, check out aisles and more. Deliver consistent scrubbing results in small, tight spaces with this easy-to-operate and maintain battery scrubber-dryer that provides peak performance year after year due to quality engineering. No-tools-required, easily accessible squeegee and brush can be changed in seconds. Easy-to-clean Hygenic® solution and recovery tanks save time and simplify maintenance. Intuitive, easy-to-understand controls simplify training and reduce re-work. Cord-free flexibility allows cleaning even when customers, patients and students are present.